This year’s New York Comic Con featured not just one but two exclusive panels for War of the Planet of the Apes. Both panels centered around the extremely talented Andy Serkis and the evolution of awe-inspiring performance capturing. Whenever we see a film which features a CGI-character, we often overlook the actor beneath the many layers of technology. We often see behind the scenes footage where actors are running around sets in bright lime green suits looking pretty silly. However, throughout the Apes series, Andy and the rest of the apes have been able to tell a compelling story that is only enhanced with CGI. Every panelist spent a good portion of each panel singing Andy’s praises. In fact, Matt Reeves, director, was so moved by Andy’s performance that he watched the entire Rise of the Planet of the Apes movie in the raw motion capture footage. Matt was still moved. He realized that watching the film with Andy in the motion capture suit was just a compelling as watching the film with a fully rendered Caesar, played by Andy. Andy recalled working with Peter Jackson on the Lord of the Rings movies. There were no rules. The tech was there but Peter wasn’t sure how it would work out. On the other side, Andy was confused. Why would he work on a film where he wouldn’t be on screen? And on top of that, this CG character would be the most important character in the film? Nevertheless, Andy gave it a try. During his first scene there were giggles heard. Peter Jackson didn’t actually expect Serkis to act while in the motion capture suit. Most people back then would just stand there and maybe move a little but acting in motion capture just wasn’t done. Naturally, Gollum evolved throughout the Lord of the Rings trilogy. In the first movie, he suited up and watched the grey mass on the screen move as he moved. Jackson wanted to copy everything Andy did including his facial expressions. By the end of the trilogy Peter Jackson offered Serkis another role: King Kong. It was then that Andy realized that maybe he might be on to a new career path. Delving deeper into the origins of motion capture, we realize that hospitals have been using it to see how joints are moving within the body. Video games have been using motion capture for ages. When Lord of the Rings came around, it was used to capture performances. This would eventually become known as Performance Capture. In Rise of the Planet of the Apes, we overlook the fact that the character Caesar was an ape. Instead, we felt that he was a human in ape skin who eventually finds himself as an outsider. Rise of the Planet of the Apes was praised by the critics and was a film that eventually led to a Best Supporting Actor Award Nomination for Serkis. Which is shocking since Caesar only utters four words: “No” and “Caesar is home” in the film. This validated the compelling storytelling that can be achieved through Performance Capture. But when it comes down to it, Performance Capture is acting. Not something new. Actors still need to do the same amount of research as they would for any other role. Ultimately, it’s a partnership between the excellent acting by Andy and his fellow apes coupled with the talented team at Weta that helps deliver a compelling film. 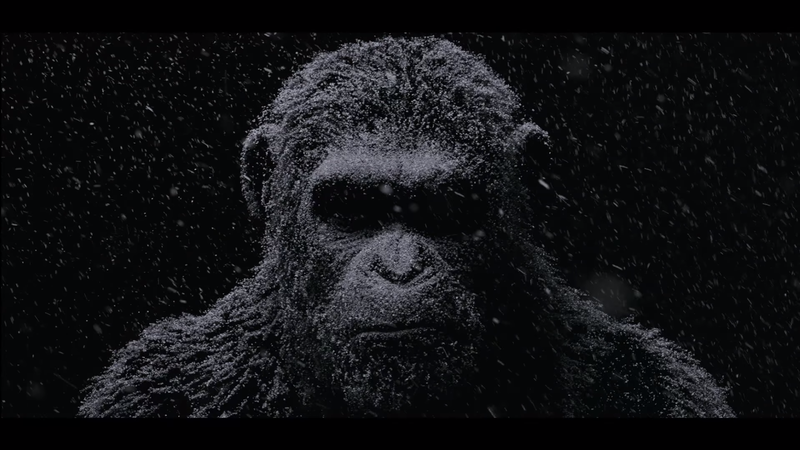 In War of the Planet of the Apes, the level of detail is increased yet again and con-goers were treated to an exclusive seven minute clip which showed how a scene was currently being worked on. There were some scenes that were fully rendered while some sections still had the actors in their motion capture suits. It was fascinating to see this first hand. Seeing actors in suits and then being slowly molded into the final render by CGI animators at Weta is something we hardly see. Now they have moved from filming on a closed set to filming in motion capture suits in the snowy outdoors. In fact, Weta doesn’t get the entire film to render in sequential shots. Instead they have to infer the context of the scenes and piece them all together as they edit. It is their talent coupled with the actor’s performance that leads to a brilliant film. So, in the end it looks like we have a lot to look forward to in War of the Planet of the Apes when it hits theaters July 2017.